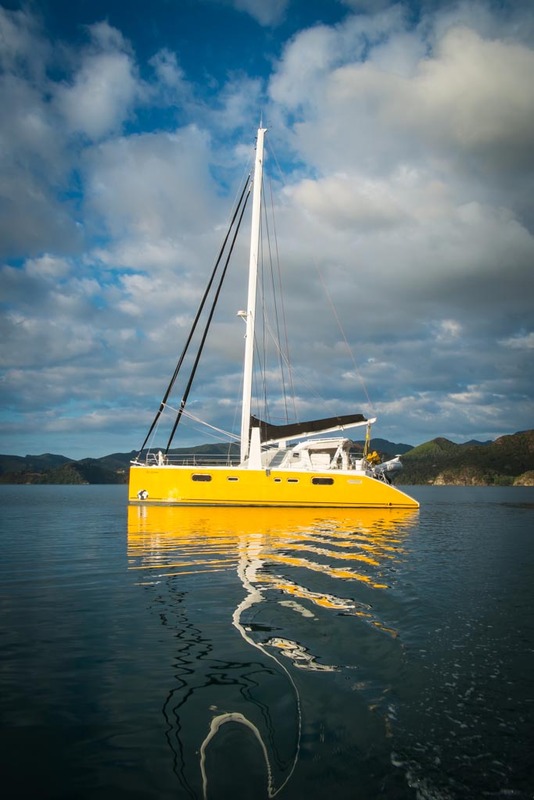 Sel Citron is a Catana 521 catamaran – a boat often described as ‘legendary’ (particularly in boat brokers’ advertising blurb). Only 18 were built, but they are regarded as one of the world’s best blue-water performance cruising catamarans for their combination of speed, comfort, safety, build quality and all-round liveability. Ours – hull number 4 – was built in 2003, in France. By ‘normal’ cruising standards, she’s a bit on the large side for a couple to manage alone, but she’s specifically set up for short-handed sailing and in fact, the previous owner (who was French and gave her the name Sel Citron) sailed her from France to Australia, mostly single-handed. She’s certainly not like anything either of us has sailed before: at 15.8 metres long and eight metres wide, it’s like sailing a tennis court. 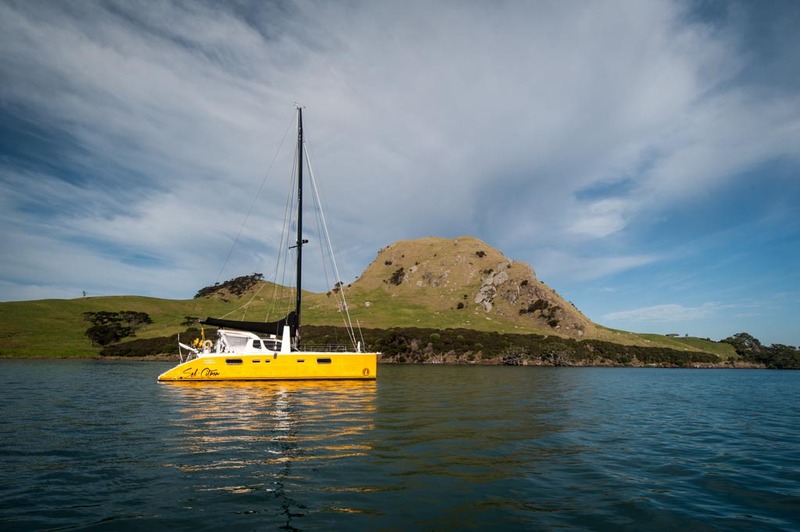 Most importantly, you can put your wine glass down and it doesn’t tip over: catamarans sail flat, rather than heeled over at 45 degrees like monohulls. It makes living on board a whole lot easier, safer and more comfortable. There’s tons of space – about the same volume as a 25-metre monohull – but just three cabins. That’s because the entire starboard hull is taken up with the ‘master suite’, with a super-king size bed, bathroom and separate head. There are two guest cabins, head and bathroom in the port hull. The living space – including the salon, galley and chart table – is on the bridge deck (the section between the hulls), opening to the cockpit. So rather than being ‘down below’ as on a monohull, you can see out in all directions. There are two helm stations, outboard aft on each hull, plus there are autopilot controls inside at the chart table (so you don’t have to be outside in inclement weather). We have twin Volvo 78hp turbo diesel engines, which will spin us on our own axis or push us along comfortably at upwards of eight knots (top speed is about 10.5 knots). We have a carbon mast, carbon/spectra mainsail, genoa and gennaker, and an asymmetric spinnaker. In theory, we should be at least one third faster, on average, than a monohull of similar length (Our top speed under sail, so far, is 19.5 knots, but we like to keep it considerably below that!). We generate electricity via the main engines, a 4Kva generator and/or the six 327 watt solar panels located on our bimini roof and cabin top – if the sun’s shining, the panels provide all our power and, in fact, we rarely run the generator. We make our own water at around 180 litres an hour with a desalinator; we have two 100 litre fridges and a 100 litre freezer. Essentially, we’re self-sufficient for power and water and in theory can go for weeks, or even months, without having to go into port. Oh, and in case you hadn’t noticed, we’re yellow. Street sign yellow. You can’t miss us. We were anchored near you last night at Owhanake Bay – Waiheke – last night. We were in the tiny (compared to you) catamaran – S/V Folau – a 2010 Leopard 38. Sel Citron certainly makes a statement and she’s beautiful. Best wishes for your adventure. Thanks for your compliments – very kind of you! Yes, it’s hard for us to ‘hide’ anywhere, that’s for sure! We did see you here in Owhanake. We are going to be around for another week or so before heading back to Oz. If we end up in the same bay again, it would be nice to meet you in person. Meanwhile, best wishes for your adventure, too.